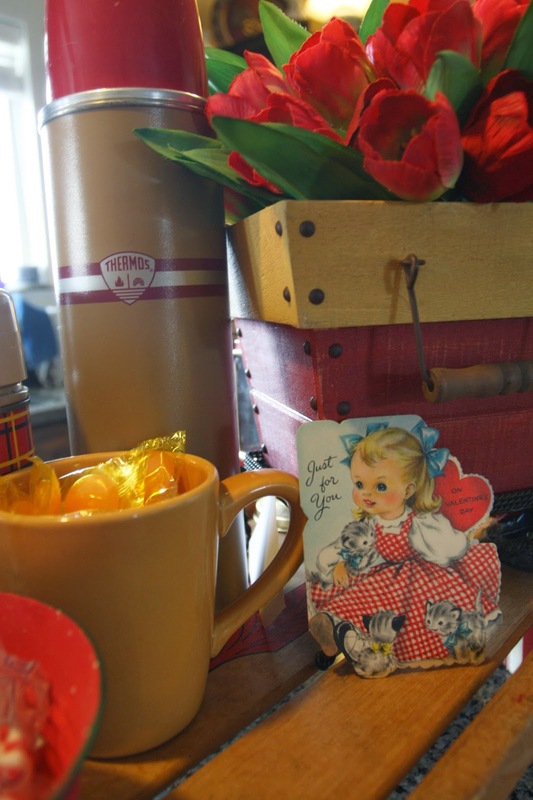 I just love all those cute little vintage Valentines cards, so I started collecting them last year. I've been lucky to find some for quite cheap, but I sure have seen some online that are outrageous in price! Eeek! I like to find images online as well, and then print them for use in decor and gifts. 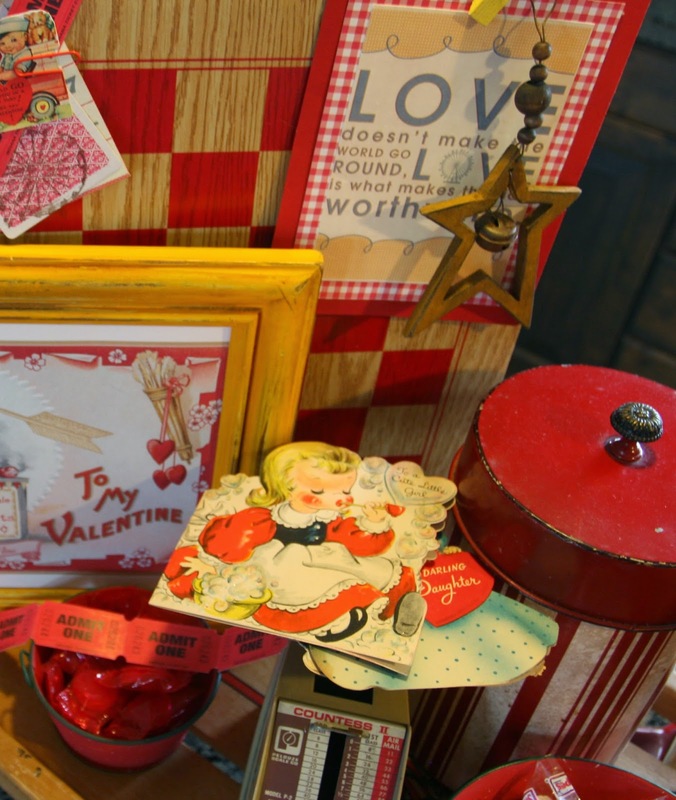 This year, my kitchen island for Valentines Day came about through combining a variety of themes, along with a recent batch of vintage cards that I acquired. 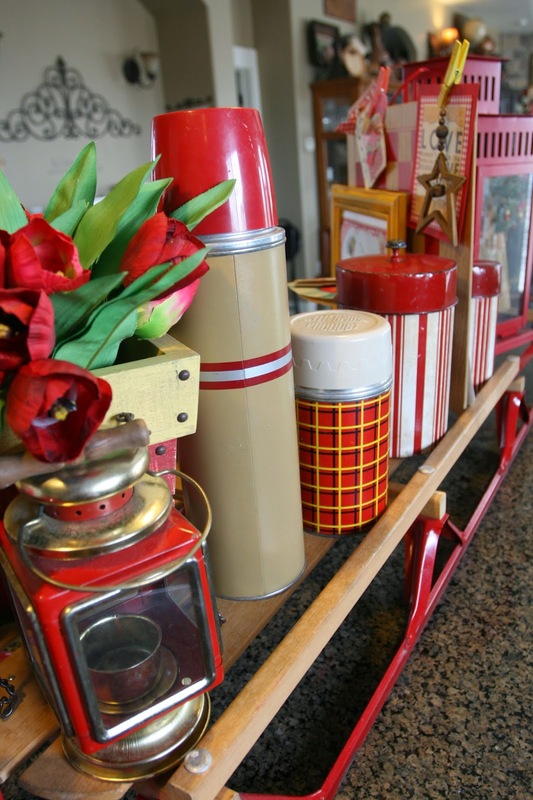 As you can see, my display encompasses a number of different themes: Vintage Valentines, Vintage Thermos', my great old sled, red checkerboard and gingham patterns, and some stripes. (And my cute little gnome that I couldn't resist adding because he matched! :) The stripes came in because I wasn't ready to put away my cute set of nesting canisters after Christmas, so I held them out. 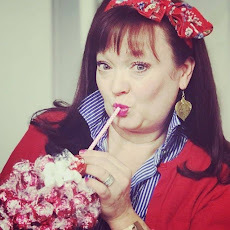 Happy day when I realized that it worked with the circus/amusement park theme that is a part of some of the valentine cards! 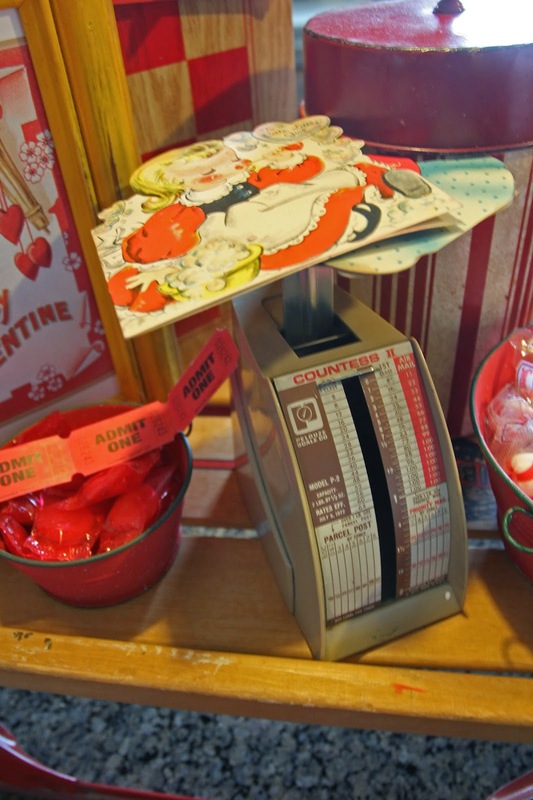 I was excited when I found this old postal scale, and I knew it would be perfect for my valentines display this year! The color of the scale (a kind of mustard yellow-green), along with the red, became inspiration for my overall design as well. Isn't this valentine cute? It says Baby's first Valentine. 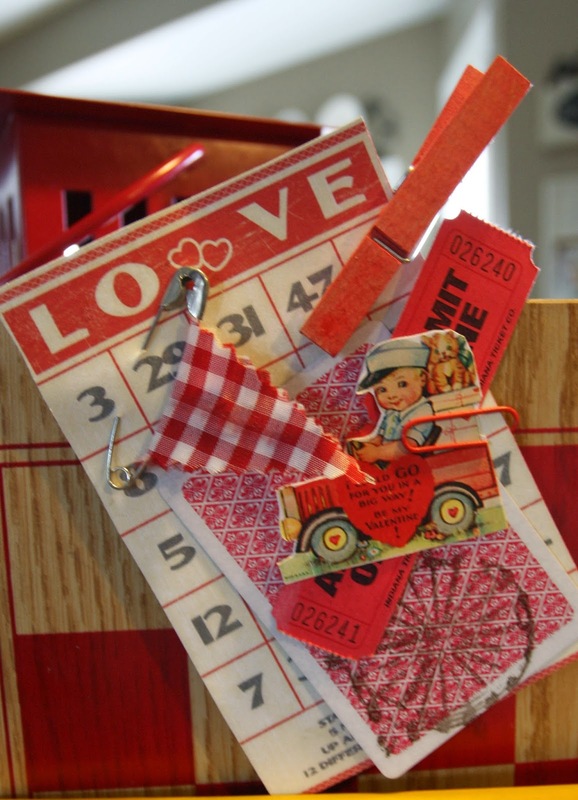 I made this little layered tag with elements I used at a previous event, a bingo card I printed from online, and a little valentine card copy. 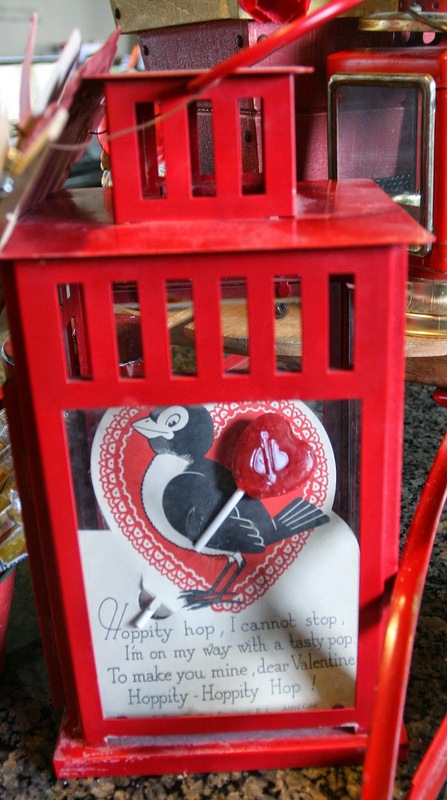 The playing card with the ferris wheel stamped on it was from an Carnival-themed adults game night that we planned for valentines day a couple of years ago. I had everyone use them as their name tags. The little fabric pennant on the safety pin was what held them onto their shirts. 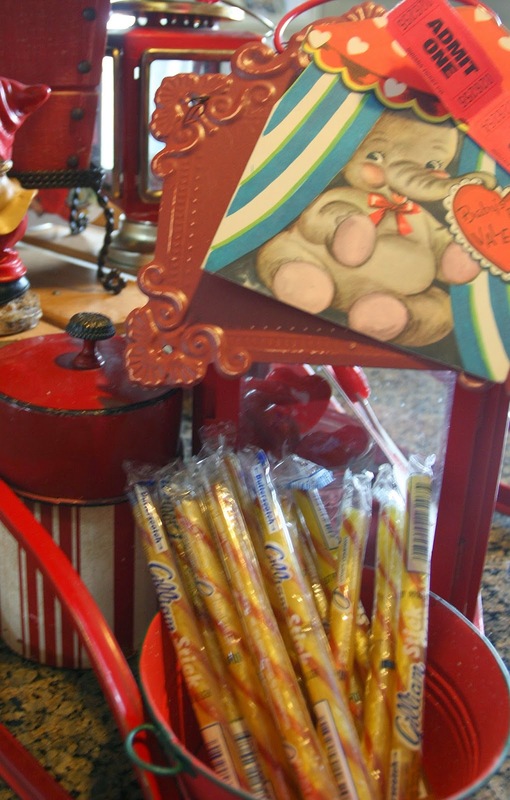 The "Love doesn't make the world go round, it makes the ride worthwhile" card shown in some of the other pics was my main image and party decor from that evening, along with a ferris wheel centerpiece that I made from a rattan wine rack! I'll have to post pics of that someday. The backside of the display. 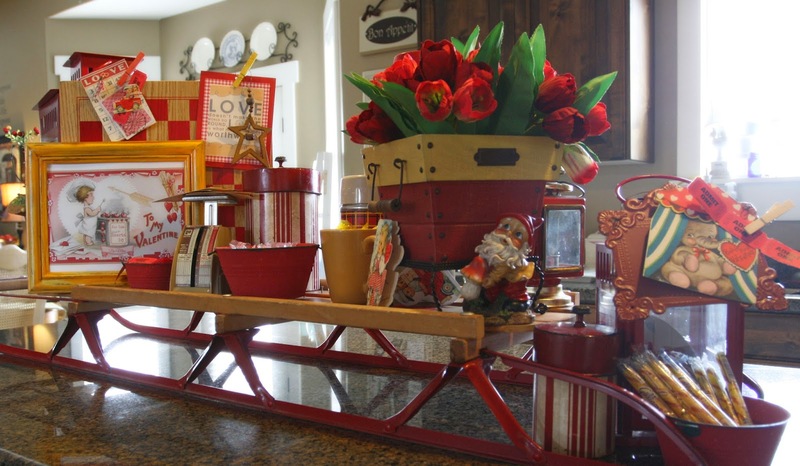 I had used one of my sleds on my table for Christmas this year, but this one is about twice the size. It's crazy how long my island is, because there's still room at both ends, and enough room for me to do food prep down by the stove. This little guy is a postcard that I bought this year, and it had the strangest saying on the sign on the side of the grille. I don't have a clue what it meant, and said something about affinity. I asked my in-laws if they knew, and they didn't either! Anyway, I played with it in PicMonkey and changed the sign as well as adding a couple more elements to it like the gold arrow and the be mine banner. Then I printed it out, and enlarged it to fit into my yellow frame. 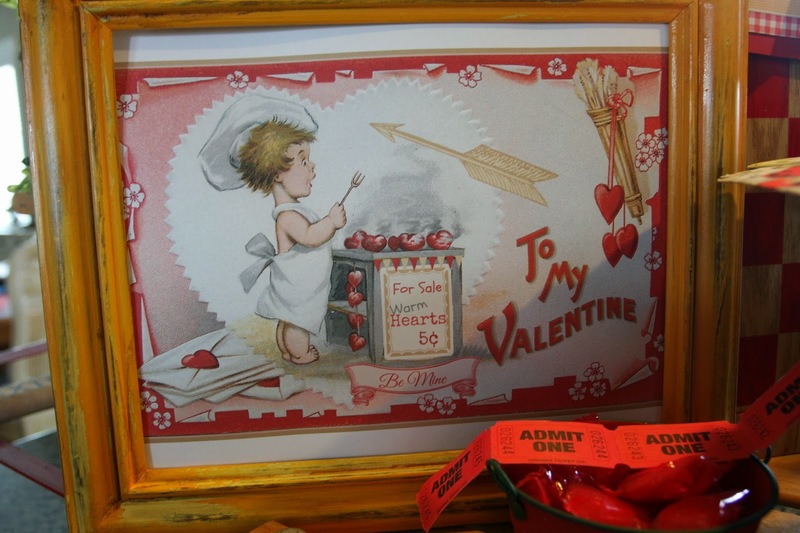 Hope you enjoyed this tour of my Vintage Valentine Kitchen display! Thanks Jill! 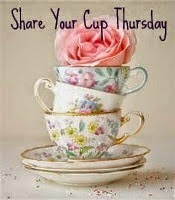 I find lots of them on sites like Ebay and Etsy, and others I find on the free graphic sites and I just download them for printing. This display was actually up for over a month on my counter! My island is huge...there's plenty of space at the end. I also have other counters I use for prepping if I need more space. 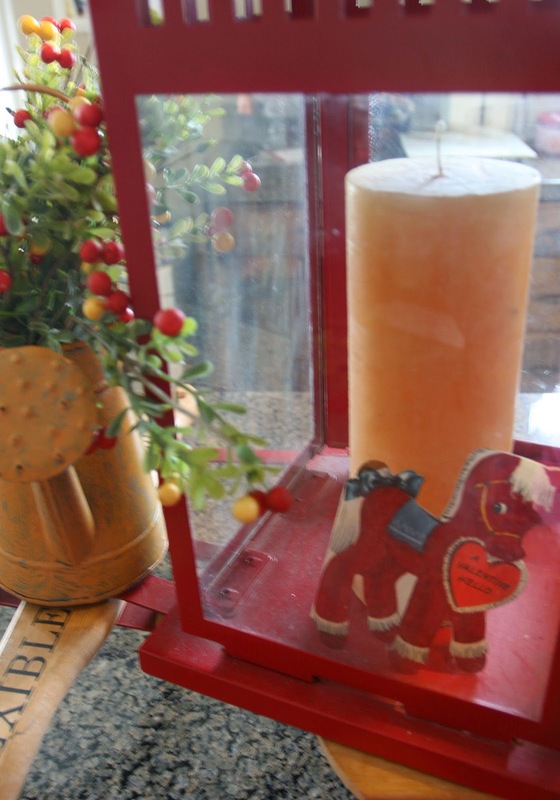 My island always has a display on it...you can check out some of my other displays on the blog! Thanks for visiting and commenting!